Somatic gain-of-function TERT promoter mutations are found in circulating leukocytes of patients with heterozygous germline TERT coding mutations. (A) Schematic of the TERT gene with the 2 gain-of-function promoter mutations located at –124 and –146 relative to the TERT cDNA start site. TSS, transcription start site. 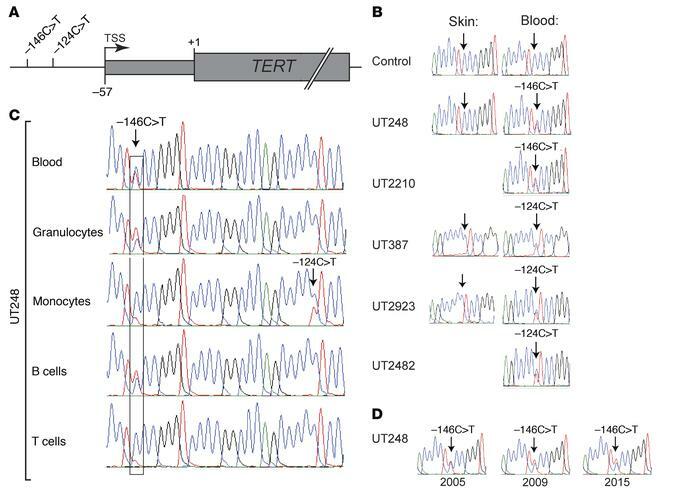 (B) Sanger sequence tracings of the TERT promoter amplified from skin and blood from unrelated subjects. (C) Flow sorting of blood leukocytes from 1 subject (UT248) shows different peak heights of the 2 different promoter mutations in various cell types. The –146C>T promoter mutation is boxed; the –124C>T promoter mutation is marked by an arrow. (D) Sanger sequence tracings of the TERT promoter –146C>T mutation amplified from independent blood samples collected from 1 subject over time.